Traveling with Alzheimer’s can be a challenge for both parties. It can seem impossible to prepare for is you are the captain of this trip. Setting it up, planning it out, and make it happen without a hiccup is up to you. It can also be scary to be the person traveling with dementia. Even the thought of the journey alone is enough to push some people into episodes. 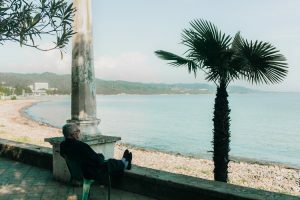 Lucky for you, Above and Beyond Senior Placement Services has put together 5 tips for traveling with Alzheimer’s patients to make your planning easier. This might seem like an obvious task when you are traveling. After all, you have to make sure everyone knows where they are going, and how they are getting there. 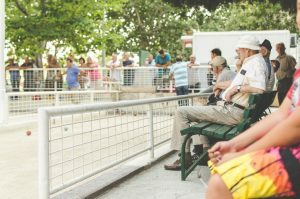 You need to take it beyond the basics if you are traveling with someone who has Alzheimer’s. Breakdown your plans to the hours if you can, and write them down. Printing an easy to read list is a great way to get your loved one familiar with the idea of the adventure. Make sure you leave copies of this travel plan for others back home, so others can help people locate you should something go wrong. Now that your loved one has a copy of the travel plans, you want to help them get familiar with the idea. Talk to them about your upcoming journey, and ask them how they feel about it. You want to help them be as comfortable as possible with the idea because the feeling of familiarity is import to dementia patients. If they have any fears about the journey, do your best to listen and understand. If they are scared of having an episode, let them know you have planned ahead. Remember, it’s always helpful to travel to familiar places with your loved one. If you go somewhere new, make sure your loved one knows what’s to come. During your planning process, it’s important to contact everyone you can about your passenger with dementia. If your loved one is in an assisted living home, it’s important to notify the staff. Believe it or not, there are cases of “missing residents” that turn out to be on vacation with the family. Instead of causing a panic, call the assisted living home and set up plans with them. Yes, a person with Alzheimer’s can fly, but it’s important to let the flight staff know ahead of time. Believe it or not, contacting your airline beforehand could get you a few benefits. Some airlines have special boarding protocols for passengers with Alzheimer’s. These could include wheelchairs, early boarding, and other benefits, so give them a call. While you are traveling, it’s important to keep a close eye on your loved one. This might seem basic, but you never know when a person might choose to wander. If they are suffering from Alzheimer’s, this could get ugly. Try to keep your loved one by your side the entire time. It’s important to keep a familiar face nearby when you travel, so they don’t get lost or confused in a new place. This is one of the best ways to help Alzheimer’s patients travel. The comfort zone is extremely important for your loved one, and that’s amplified when you travel. It’s important to give them time to wander, but make sure you wander with them. While you are in the process of traveling, your loved one might get bored. This could get messy as the boredom could set off other feelings of panic and isolation in the air or in the car. To counteract this possibility, put together a few stimulating activities like puzzles for people with Alzheimer’s. These activities can keep your loved one captivated for hours while you travel. Coloring books, puzzles, books and magazines are all great ways to keep your loved one entertained. If you don’t have those things on hand, you can always entertain with a good conversation. You can help keep them calm by asking them questions about the trip or their favorite loved ones. You could also play games with your loved one like tic-tac-toe or go fish. Try to keep it simple, but make sure it keeps your loved one entertained. On today’s flights, they might be able to watch a movie or get the news from their plane seat. It really depends on how far you are flying. These TVs are normally on the bigger planes for longer journeys. Many people might ask, “can Alzheimer’s patients travel?” The answer is yes. People with Alzheimer’s shouldn’t have to miss out on adventures or holidays with the family. Ask a matter of fact, the contact with family and friends is shown to help fight the onset of Dementia. It is important to keep in mind that the travel itself could be a stressful situation. Stressful situations could agitate the symptoms of dementia, so be patient. Keeping a cool head and thinking through situations will help your loved suffering from Alzheimer’s stay calm too. The more relaxed they are, the less likely they are to have an episode. Take into account the situation your loved one is in. If they are having episodes all the time, traveling might not be the best idea. If their episodes are sparse, traveling should be just fine. Simply put, use your best judgment when it comes to traveling with a loved one with Alzheimer’s. When you use a calm head and plan your journey, you’re sure to have a great time with everyone on vacation. Just follow these steps from Above and Beyond Senior Placement Services for smooth travels.